King Khan Arrives in Times Square! 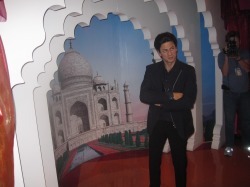 NEW YORK: Bollywood actor, producer and television host, Shah Rukh Khan is now immortalized in wax at the Madame Tussaud's New York City location in Times Square. Press was invited on August 12, 2010 for an unveiling of the King of Bollywood with a dance performance by Bollywood Axion. 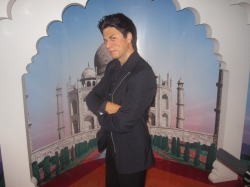 Khan, who has acted in over fifty films throughout his career will have his wax figure located in the 'Bollywood Zone' in front of a replica of the Taj Mahal and will be in the same room as Amitabh Bachchan. Visitors of the wax museum will get a chance to pose with these Indian film legends and feel like they are on a Bollywood film set.